Johnson's Sewing has been serving Edmonton for 50 years! In 1969 Ron and Doreen Johnson decided to open a sewing machine sales and service business and called it Johnson’s Sewing Machine Clinic, and it was located at 10736 124 Street in Edmonton, Alberta. Johnson’s Sewing Machine Clinic sold and serviced all domestic and commercial sewing products for over 22 years. Customer Service was the selling point at Johnson’s and with top quality service, the sales of sewing machines grew very strong over that period. September 1992 saw the sale and transition of Johnson’s to one of the company's valued employees. That was the year Linda St Pierre and husband Brad purchased the business from the Johnsons. Shortly after the purchase, the name was changed to Johnson’s Sewing Centre. In 1994 A Quilters Dream was added providing the quilting population with an additional location to find a large selection of very high-quality fabrics and notions for their quilting projects. Quilter's Dream is celebrating 25 years this year! Approximately 23 years ago a second 4400 square foot location was opened at 4359 99 Street in south Edmonton. 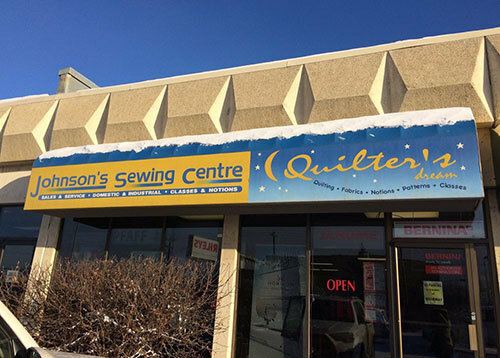 While providing fabric and sewing products, service became a major focal point at the south Edmonton location. In 2013 Craig St Pierre assumed the position of General Manager and in doing so has brought the business into the cyber era of online marketing and has continued with the essentials of providing quality customer service. Today we are a multi-award winning dealer of Janome, Pfaff, Bernina, Q'nique and Juki domestic sewing products, and one of the largest suppliers of retail sewing products in Canada. Aside from our retail ventures, we are constantly looking for opportunities to help our market area with numerous charities such as Santa’s Anonymous, MS, Cancer and School fundraising drives and many others. Johnson’s Sewing Centre is a 17-year winner of the Consumer Choice Award as voted on by the general public for top quality products and service in the Edmonton area! *Available only by booking your service appointment 14 or more days in advance.